Images from the opening reception of Patrick V. McGrath Muñiz’s “Sacro Consumo” and Shaun Berke’s “Sacrosant” at La Luz de Jesus Gallery. 11/7/14. Shaun Berke’s “Sacrosant” opens at La Luz de Jesus Gallery tonight, November 7 along with Patrick V. McGrath Muñiz’s “Sacro Consumo”. These photos were taken in his studio while the show was in process. The concept of Shaun’s show is an “exploration between being a simple hominid and the principals that we impose on ourselves.” The body of work is very much like an exploration as Berke figures out how best to convey these ideas. On the shelf books open to painterly pieces by Rembrandt and others gives Shaun compositional study. Literature helps to inspire and self-written motivational reminders keep him on track. Shaun paints in his Pasadena apartment turned studio, by the north facing window in the dining room due to the consistency of the natural light. In one of the bedrooms, Shaun has setup a workshop with a drafting table which he uses for drawing, and numerous tools which he uses for framing. Some of his frames are found and pieces are created in sizes especially for the frames. Shaun lives with his cat Otka who likes to hang out when he paints and is also quite good at opening kitchen cabinets! Paid parking is available at the Pasadena Convention Center and several surrounding parking lots including Paseo Colorado directly across from the convention center (parking map). We are proud to announce that we have partnered with the Hilton Pasadena, as the official Designer Con 2014 hotel! Designer Con is an annual art and design convention that smashes together collectible toys and designer goods with urban, underground and pop art! DCon is over 70,000 sq. ft. and features over 300 vendors, art & custom shows, live demonstrations, and much more! The show coordinators, Ayleen Gaspar & Ben Goretsky, strive to provide a fun, safe, comfortable environment for fans, artists, and vendors to meet. Join us in November at the Pasadena Convention Center for a weekend of fun, toys, and art! Several artists from San Diego are participating – here are some quotes and images from a few of the artists. Media: please contact me for more images, interview opportunities, event background, and media credentials if you would like to come out for the event! At Designer Con I will be featuring hand-created figurines, illustration prints, books, probably a coloring book, and other merchandise based on my characters. I’m attaching a couple of them in hand-drawn pencil illustration form. I also am offering commissioned custom figurines. I feel it’s important to travel to Pasadena for Designer Con since I really love that convention and it’s the right place for me and my art. I am especially enthusiastic that it’s a unique, intimate, and energetic convention, which showcases very talented independent artists/designers and has mostly 3D/sculptural art, which is my forte (my collection started as ceramic sculptures). This will be my first time showing my art and being a vendor at Designer Con. It’s a great place to start as a vendor, being that it’s not as huge as San Diego Comic Con. Another artist/vendor told me about Designer Con last year, so I checked it out and spent all weekend there talking to a lot of friendly vendors and doing research. The various types of art, merchandise, talent and imagination of the artists is incredible! Click Mort Best Love Art Treasures Signing! Elephant, rhino, and crocodile-headed birds. Dog and cat-headed adolescents. Domestic bliss embodied by rabbit-headed parents and a baby carrot, taking her first steps. Such is the whimsical oeuvre of artist Click Mort, whose remixed nostalgia figurines have made their way into the collections of Mark Ryden, Long Gone John, and director James Gunn, who supplied the foreword to The World’s Best Loved Art Treasures by Click Mort. This tiny, hardbound collection features 88 full-color pages of sculptures that may have once adorned your mother’s mantle piece, but have been transformed into true surrealist masterpieces via scalpel and epoxy. Pick up a copy of Click’s first book and goad him into regaling you with tales of his history as a musician (with The Cramps), stories about his favorite art forgers, and maybe even an anecdote or two about what inspired the art in these pages. Click will be signing alone, but some very special guests have promised to turn up and congratulate him. There will be ample opportunity for Q&A throughout the book signing with the author. Reserve your signed copy today! Contact the book store for purchase information. The install and preview of La Luz de Jesus and LA Beer Week’s 2nd Annual Coaster Show, shot between September 2- September 4, 2014. A phenomenal show featuring over 1050 pieces, running from September 5- September 28. The show was put together by gallery director Matt Kennedy with LA Beer Week’s Brandon Bradford, mapped out by Billy Shire, and hung by interns and La Luz de Jesus staff. Also showing, Harold Fox “On the Fringe of the Mundane” Click here for show preview! As part of La Luz de Jesus’ five-person Laluzapalooza Jury Winners show, Sean Stepanoff’s first featured exhibition at the gallery, “Entitled Hair Cut”, is inspired by the colorful folk art of African barber shop signs and the local “culture” of his Silver Lake neighborhood. Stepanoff , a skilled animator, has a sharp, clean and dark psychedelic style, and is the creator of the large format, beautifully printed compilation art zine “Gristle” featuring contributors such as David Choe, Camille Rose Garcia, Tara McPherson and others, as well as publishing limited digest size publications such as “Freaks and Geeks” and “Eyesore” which contain his instantly identifiable drawings. Stepanoff provided the complete character design for Eminem’s ‘The Slim Shady Show’ & served as designer for a video project of Erykah Badu. I paid a visit to Stepanoff’s Silver Lake home while he was working on the show in his living-room / art studio surrounded by records and art, snapped some photos and asked about his show. Stepanoff, also a Wacko / La Luz de Jesus employee who creates in-store graphics for the shop, was guided to the concept for his show by La Luz de Jesus Gallery director Matt Kennedy. I did a sign at Wacko for these African barbershop signs which are brought in by guy in full African garb, sold to the shop, displayed and resold to the public. Inspired by Stepanoff’s graphic, Kennedy came up with an idea for a show, featuring “privileged hipsters” on African barbershop signs. Stepanoff took the concept of “hipsterdom” and rolled with it. The African barbershop signs are created in what Stepanoff calls a “naive style, which has a charm.” Stepanoff wanted to keep that charm; appropriating the concept by keeping it simple and displaying common trends. “In Africa they’ll do a Two Pac sign or an Obama cut” sates Stepanoff. Stepanoff’s show is as local as you can get, featuring La Luz de Jesus neighboring Siver Lake icons like the Happy / Sad foot sign (a sign for a podiatrist’s office on Sunset which is a Silver Lake landmark; a rotating cartoon foot, smiling on one side and frowning, holding a crutch on the other. Some “hipsters’ belive that whichever side the sign is on when you pass by, will determine what kind of day you will have), Intelligentsia Coffee, Black Flag tattoos (displayed by people who weren’t even born when the band broke up), sacred geometry, headbands, etc. “I’m trying to make it look specifically LA, not trying to make it look San Francisco or New York – though I’d love to go city by city, Portland, Seattle! I’d like to do Hall and Oats, looking at each other with their haircuts. Wacko / La Luz de Jesus owner Billy Shire suggested he run them over with a car. At this time, Stepanoff has sold all but one of the pieces and his show will be up through August 31 along with José Rodolfo Loaiza Ontiveros’ “Profanity Pop” and works by the other four group show jury winners Allison ‘Hueman’ Torneros, JINX, Katherine Brannock and Frank Forte. Pick up that last piece before someone else does! Click here to check out his show as well as all the others! Tiki Oasis 14 Art Show and Car Show! Man… dig those crazy brushstrokes! Free Admission – Open to the Public! All original artwork is for sale! Tiki Oasis 6th Annual Car Show! Free admission – Open to the Public!Dig it, Daddy-O! Frenched tail lights! Metal flake, Jake! Like, slammed and chopped, Pops! Don’t miss this scene, Gene! Or live in Shameful Regret! 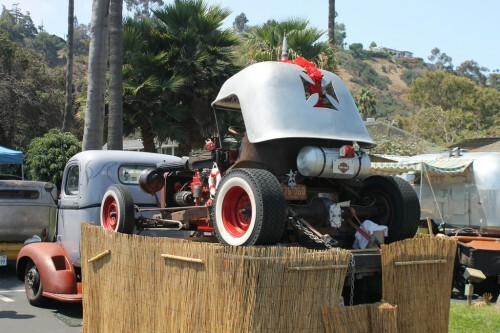 Blow your top on the coolest and craziest collection of vintage chariots featuring…. 1953 Chevy Coupe Kustom – 1955 Chevy Wagon Kustom – 1936 Ford 3 Window Coupe – 1953 Chevrolet Bel Air Kustom – 1954 Ford Customline – 1963 Ford Galaxie Convertible – 1939 Ford Deluxe Coupe – 1962 Cadillac Sedan DeVille – 1960 Cadillac Series 62 Coupe – 1958 Ford Ranchero – 1956 Oldsmosbile 98 – 1961 Ford Econoline Truck – 1941 Chevy – 1927 Roadster – 1962 Chevrolet Impala – 1963 Chevrolet C-10 Longbed Pickup – 1960’s Studebaker – 1964 Spit Window Tiki Themed VW Bus – Deadhead Rum’s 1958 travel trailer and Tiki bar – 1965 Split window 21 window VW Bus – 1966 Ford Econoline Van – 1960 Manx Style Beatnik Special Dune Buggy – 1969 Chevrolet Camaro SS 396 Convertible AND MORE! 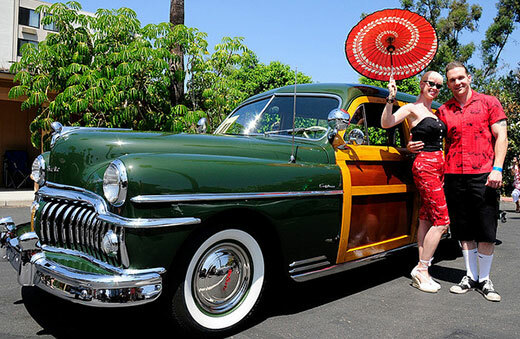 View video of previous Tiki Oasis Car Shows here! Tiki Oasis 14 “Beat Tiki” – Event Overview! Please join us at the biggest Tiki Weekender! Tiki Oasis’ “Beat-Tiki” weekender offers a unique pairing of the Beatnik and Tiki ethos. Like the Beat Generation of legend and lore, today’s Tiki aficionados are drawn to primitivism and thirst to reconnect with the primal past, celebrating it in a modern context. Spend a carefree weekend in an urban oasis amidst fellow barefoot bohemians, reveling in the kind of art, music, literature and mixology that is sure to flip your lid! Our 5th annual art show features over 20 top Tiki artists from around the globe. All original artwork is for sale. Click for more information and to view a few of the pieces! Burlesque Show – Midnight at Tiki Oasis! Sunday night at Tiki Oasis is a… Post-Beatnik Garage Rock Bash! Tiki Oasis is the crossroads of the Tiki world. Craftsmen, artists, tinkerers, and traders haul their wares to Tiki Oasis creating an Exotica emporium unmatched throughout the world. Many vendors create limited edition items specifically for the Tiki Oasis weekend shoppers! Note that the Beauty Bungalow will be open Thursday-Sunday 10am – 4pm. Full List of Tiki Oasis 2014 Marketplace Vendors Below! Visit the Deadhead 1958 Travel Trailer / Tiki Bar at the Tiki Oasis Car Show in the parking lot of the Crowne Plaza Hotel on Saturday, August 17 and Sunday August 18 and purchase Limited Edition Deadhead glassware! Dig all the Tiki Oasis 2014 Marketplace Vendors!! Tiki Oasis Special Event: Cigar n’ Rum Pairing! DIG TIKI OASIS the BIGGEST TIKI WEEKENDER on the PLANET! TIKI OASIS SPECIAL EVENT… CIGAR n’ RUM PAIRING! Come join us for a sip and a smoke at the Tiki Oasis Cigar n’ Rum Pairing Lounge. Co-Sponsored by Muneca Cigars, Zacapa Rum, Denizen Rum and Lost Spirits. Tiki Oasis invites you to a special Cigar and Rum pairing experience in an exclusive cabana lounge setting. You will taste and learn about these premium rums and enjoy hand-selected cigars that pair exceptionally well with these rums.